The tensions between the government and the council have flared up again, for the first time under the new council. This time it stems from the obsession with a few developers for the provision of car parking, and the council’s resistance to bankroll them. Yesterday, Georgina Stylianou revealed that the earthquake recovery minister Gerry Brownlee had used his “special powers” to fast-track a car parking building for Phillip Carter, the brother of the Speaker of the House, National MP David Carter. This was followed by a chorus of down-on-their-luck property developers piping in that they too needed more car parks, and that could the government please build some for them. The sad, bizarre situation in Christchurch right now is that there are more people lobbying for the rights of cars to sit motionless than there are trying to house human beings. I don’t believe that this is what the city asked for, through Share an Idea, but it’s what we’re going to get when the people with all the power are ageing white men for whom the keys to a luxury European car is the most important symbol of status. Even the Press is buying into their narrative, with Stylianou, one of their best reporters, jumping across into an opinion piece that could have been ghost written by the Carter Group. Never mind that here’s a story from less than a month ago about a 400-car park in the central city that sits virtually empty every day. No, the demand for carparks is so obvious and necessary that the developers and their man in charge are going to war with the council, again, to ensure that the ratepayer stumps up for the facilities that they’re too cheap to build. For the citizens of the city, they get hit twice; not only will we be lumped with these dead zones of urbanism, best suited to the 1950’s, but we’re going to pay for it too. Decisions made by developers, including notably the justice precinct development by the Crown, not to provide car parking on site is creating additional pressure. These developers are building their buildings, not factoring in enough car parking for their tenants, then going cap in hand to the council and asking them to stump up. When the council tells them to get stuffed, they turn around to their mate Gerry, who overrules the council and the developers get their way. Once again, it’s the taxpayer and the ratepayer who are left to pick up the tab. 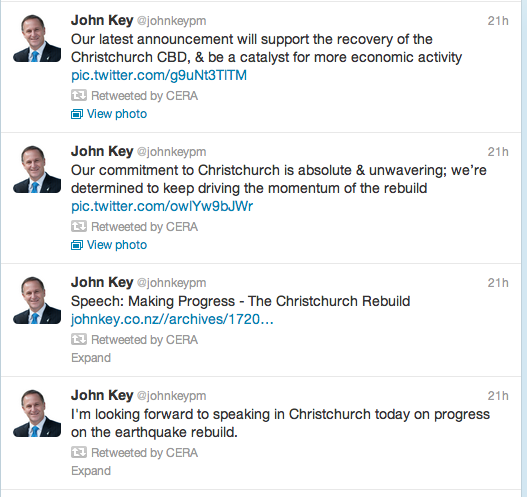 John Key was down in Christchurch yesterday, making some announcements about the CBD (which I might discuss later). He did his usual – poorly designed infographic with a picture of him, tweeted out. That’s fine, I’d expect that. What I didn’t expect was that CERA would retweet it. Clearly, what the Prime Minister has to say is important to CERA and the recovery; however, CERA is a government department, and should remain apolitical. 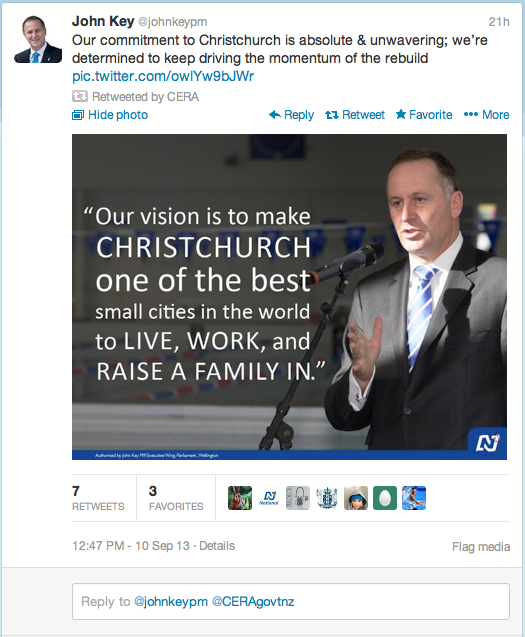 Posting National Party material through these channels crosses the line into political activism. 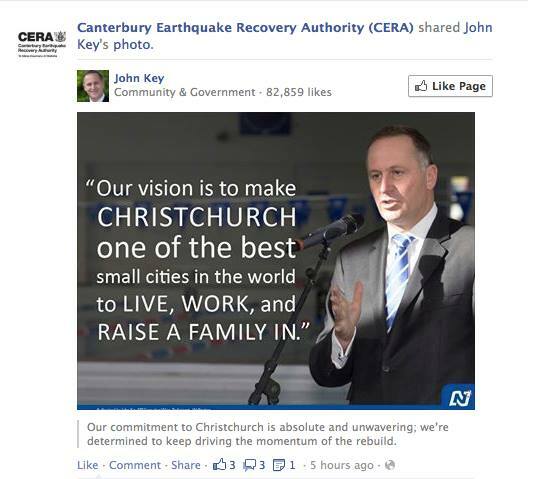 Remember all those times when Brownlee has claimed that the opposition were “politicizing” the earthquakes? Well, here he is, using a massive government department to do exactly that. Bob Parker’s campaign launch The cost sharing agreement between the Government and the council was finalised today. In a rather jovial meeting, Gerry, John and Bob divided up the pie and told us all what it’s going to cost. The Press has a very comprehensive summary of all the items and what is going to be paid for them. Of the $4.8 billion, central government is paying $2.9 billion, with the council taking the remaining $1.9 billion. All the joking around from Parker is meant to give the impression that the council got a good deal, thanks to the tough negotiating style of our mayor. A detailed breakdown of the rebuild cost reveals the lion’s share of the money will be for work already under way on pipes and roads – a total of $2.9 billion, with $1.8 billion the best estimate of the Crown’s likely contribution, and $1.1 billion as the council’s share. The balance will see the Crown fund $1.1 billion of projects in the central business district and the council $765 million. $1100 million to the Crown, $765 million to the council. So what is the Crown spending most of that money on? $481 million for the Frame i.e. land banking. Is it really legit for the government to include this money, as though it is an investment? I’ve railed against the frame since practically when it was announced, but this isn’t even about the stupidity of the idea. This is money that is going to be spent on property that the Crown is going to flick on quickly – they’ve already started the process. I think it’s pretty dishonest for the government to use a bookkeeping trick to make it look like they are spending more than they are. This is not $481 million being invested in an asset – it’s money going out of one account but coming back into another. If you take that figure out, the Crown’s contribution is actually more like $620 million – quite a bit less than the amount being asked of ratepayers. The Crown will lead the convention centre rebuild. It is hoping to secure private sector investment but has allocated $284m to the precinct. While they are “hoping” to find a friend to come on board, it’s worth comparing it with the Sky City convention centre. That project is meant to cost $402 million, which breaks down to $315 million for the building, $87 million for the land. The Auckland one is meant to hold up to 3500 delegates, whilst the Christchurch one is meant to be around 2000. So a little more than half the number of delegates, but for a comparable price? ($284m vs $315m) The council was budgeting just $151 million for the Convention Centre – so getting an efficient PPP set up somehow means it’s going to cost an additional $130 million? Something smells fishy there. If you take out the Frame and the Convention Centre, the amount the government is paying for projects that it is forcing on the people of Christchurch is actually pretty pitiful. If you haven’t read Barnaby Bennett’s take on the Town Hall, you really should. It is a comprehensive summary of the argument that is well referenced and provides some much-needed perspective. He talks about the way Brownlee has framed the argument – and this should be something that echoes beyond just Christchurch, as he’s doing the same deceptive dance on Auckland transport. I think the Christchurch Blueprint breaks all four of Jane Jacobs’ rules! As seen with his behaviour around transport in Auckland, Gerry Brownlee seems to view “evidence” with an arrogant disregard, as nothing more than a nuisance.